Taken c1872. 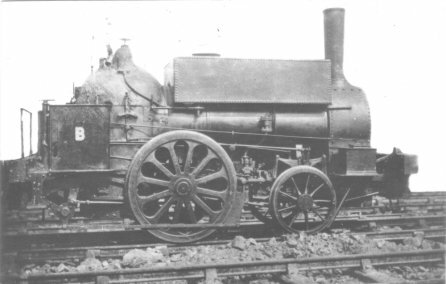 CHPR Number 2 loco, supplied by Edward Bury. It replaced horses on a section of the CHPR in 1860. Note the missing tender and added saddle tank (fitted later in Crewe). Edward Bury's 2-2-0 Passenger Engine, 1837: London and Birmingham Railway. At first the Cromford & High Peak Railway was worked entirely by stationary engines and horses. The CHPR bought its first loco in 1833 from Robert Stephenson & Co, and was named Peak. The second CHPR loco was supplied in 1835 by Bury of Liverpool, and worked the line for 38 years until 1873. 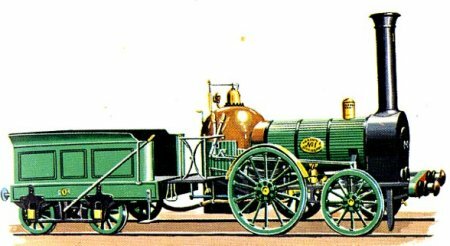 In 1835 Edward Bury & Co of Liverpool supplied a 2-2-0 tender locomotive which became CHPR No 2 (Cromford and High Peak Railway). It may have been obtained second hand. Cylinders were 12 x 18 in, driving wheels 4ft 8in, leading wheels 3ft 0in; length of engine 18ft 6in; engine and tender 32ft 3in; weight 9½ tons. In 1860 this locomotive replaced horses on the High Peak Junction - Sheep Pasture foot section. In June 1864 the boiler was fitted with a new copper firebox at Longsight, Manchester, and it returned to the CHPR to the Sheep Pasture foot section where it worked from 26 January to 10 April 1865. It was then transferred to the Hopton top - Hurdlow foot section and remained there until 17 March 1868. Afterwards it worked on the Sheep Pasture top and bottom sections. When taken into LNWR stock in November 1871 it was numbered 2039 but a month later it became 1942 in the duplicate list of locomotives. Later it was fitted at Crewe with a saddle tank and the weight became 5 tons 4 cwt + 8 tons 14 cwt, total 13 tons 18 cwt. In May 1873 it was transferred to Crewe Locomotive Machinery Department and given the Letter 'B' (see photograph) and it shunted at Crewe works until it was scrapped in May 1876. 'The Cromford & High Peak Railway' by John Marshall. Edward Bury was once described as a man strongly endowed with the commercial instinct. He certainly contrived to play, very successfully, the role of Locomotive Superintendent of the London and Birmingham Railway and contractor for the supply of locomotives at one and the same time. His engines were light, ingeniously constructed, and so very cheap; and in his role as user of them he saw to it that they were not overworked. The distinguishing feature of all his engines was the use of bar frames, which gave them a light, spidery appearance. They had circular fireboxes, with a steam dome and safety valve on the top. The passenger engines on the London and Birmingham were of the 2-2-0 type, while the goods, otherwise similar, were 0-4-0. If one engine were not enough to do the job he put on two, three, and sometimes even four on one train! It was all good for the locomotive trade. Like many engines of those early days the Bury's rode badly, partly because of the very short wheelbase, and the lightness of the tenders. The London and Birmingham nevertheless remained a home of these light four-wheeled engines long after all other main lines had abandoned them for longer and larger engines, and in view of the heavy traffic on the line, and the multitudes of engines necessary to work it, the four-wheeled Bury's, whether of the 2-2-0 or 0-4-0 type, have a special place in railway history.